CYCLINGFORUM.COM -- View topic - Gravel bike? "I'm perfectly fine with 2x mechanical"
I am in this camp as well. 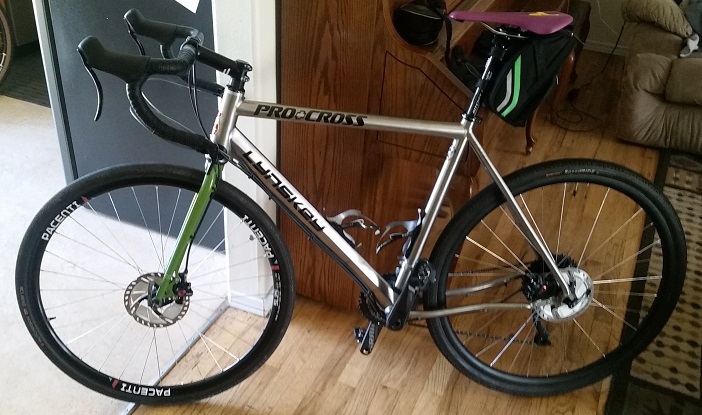 The Lynskey is 11-36 with 28/42 rings. To my mind, I have the 42 top instead of a 38. And a 28 Granny for my sad old ars to mow up most things. But you pays your money and makes your choices. Used the bike for commuting and grocery shopping today with the Bontrager shopper pannier. On off in 5 seconds. Perfect. I guess we'll have to agree to disagree on 1x vs. 2x. I really like having the closer gearing spacing that I get with a 2x, even on gravel and off-road. Yeah, we get to have the conversion. With off the peg parts too. Some of us here cobbled 30/46 cranks 25 years or more back. Yeah it’s just personal preference, like many things. I’ve already ridden the 1x11 on the type of riding I will mostly do on this bike, short steep dirt hills, and around town commuting, and love it. I like the simplicity of no front shifts, I actually like the gaps as I am often making big shifts in big terrain transitions, and don’t care about going fast on the flats (plus I doubt it slows me down much anyway). I’m not suggesting I am right and anyone else is wrong, but I think this setup will be great for me. A great thing about cycling is that everyone can do whatever the fork they want. Depends on the terrain. Half a dozen of us went on an ~80km ride yesterday along part of what's called the Centenary Trail, which follows the hills that surround Canberra on about a 25/75 mixture of unsealed bush tracks and single track. I noticed that the two riders on 1x (both quite strong) couldn't get up some of the short, rather steep hills that I could still manage on my 2x with 29t small chainring. The limiting factor on some of the steeper very rocky stuff was having the front wheel completely un-weight - things get kind of interesting when that happens over grapefruit-sized rocks. At the end of the ride my Garmin indicated a max gradient of 21% somewhere - could have been any of a number of the climbs. I took my Open gravel bike shod with 48mm file tread tyres. It worked ok, but if I'd realized that the majority of it was single track I would have fitted knobbier tyres. An interesting topic on its own. Though I’m not sure how 1x vs 2x plays into it. I actually have a lower gear on my 1x than the 2x that got my up 27% Achambo Rd at D2R2. If the limiting factor is front wheel lifting, how does 1x vs 2x play into that? I’ll admit that you can probably get a somewhat more extreme low gear with a 2x, but that doesn’t affect the wheel lifting, right? I’ve had a couple wheel lifting experiences. At Mt Washington there’s a section of the dirt road part above tree line (“5 mile grade”) where the front wheel always lifts. I would slide my weight forward, and then the rear wheel spins. Always managed to stay up though. The wheel also lifts on the aforementioned Achambo Rd, which is 27% rutted dirt. You are thrashing so hard just to keep going, that the airborne front wheel moves sideways in the air. So the challenge is to get the wheel down somewhere that keeps the bike moving forward. My buddy Mike was next to me and his wheel came down in a rut so he fell over. Mine came down OK, through luck rather than skill, so I got up. Honest Mainer that he is, Mike walked down 10’ before restarting so To be sure he rode the whole hill. Yes he did manage to restart. Not seeing where a 1X vs. 2X changes the ability to climb, IF the gearing range is essentially the same. My Sunrace 11 spd. cassette on my mt. bike has a 19 inch low. My old 26" with a triple has a 17 inch low. If I really, really needed that 17 low (which I cannot recall using in a decade) I could go to a 12 spd. 10-50 system. At some point it's so steep I can't keep control and am walking. I'm not commenting on the gaps an 11 or 12 spd. cassette creates, that's an issue I don't see while pure mt. biking. I could see it being annoying if I was riding easy rollers or flats on a Gravel. Steve, which Sunrace are you using? I just popped on an 11-40 onto the TA wheel I built for the Lynskey for 700c. Only have used a 11-36 sunrace so far. The Pro-Cx is at capacity with the 36, not too sure until I get it on there how the 40 is going work, 4 teeth over spec/capacity. Considering I have used 4 over capacity on SS Shimano DRs, thinking it ought to work sans a Wolftooth etc. Using RD-R8000-GS. Shadow type, cage seem long! Not certain which Sunrace model as it came supplied on the Specialized Chisel Comp I recently purchased. It's an 11-46. Not sure I've gotten up to the 46 yet in anger. 700c, 42mm Speedride [39mm] rear, 35 Override [36mm] front.